Abu Dhabi, United Arab Emirates, 3 February 2019. Ferrari World Abu Dhabi, the region’s Leading Theme Park, welcomed the Chinese Ambassador, H.E. Ni Jian, on Friday February 1st, to raise the curtain on the park’s exciting Chinese New Year celebrations. 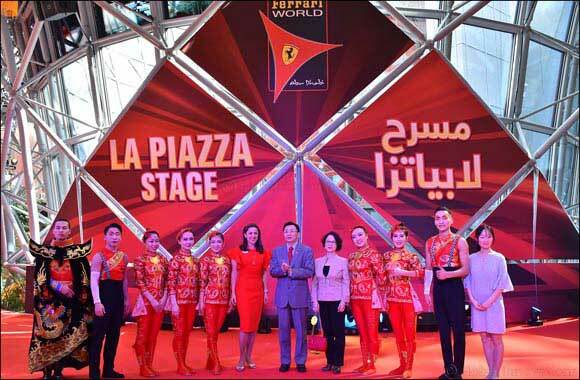 After a welcome note from Bianca Sammut, General Manager at Ferrari World Abu Dhabi, the Ambassador took part in traditional Chinese rituals such as ‘dotting of the eyes’ and ‘plucking the greens’ before the start of the entertainment program. Festivities at the Ferrari-branded theme park commenced with a parade led by dancing dragons, followed by captivating stage performances by the award-winning Shenyang Acrobatic Troupes and the Shaolin Monks. “This year, Chinese New Year celebrations at Ferrari World Abu Dhabi are bigger and better than ever before. We have introduced a variety of performances and attractions that capture the true spirit of the Far East in this important event,” commented Bianca. “We’re pulling out all the stops to ensure that guests of all ages truly enjoy an unforgettable experience with the entire family, and I’d like to thank all H.E. Ni Jian, our guests, and all the artists and entertainers who have joined us at the park to mark this special occasion with us,” she added. The park’s fifth annual Chinese New Year celebrations will host a plethora of activities and attractions for guests of all ages, including circus and martial arts performances, a Chinese arts and crafts area, and Khalil’s Kung Fu Academy, among many other surprises. Guests can join the Chinese New Year festivities every day until February 09, from 11AM to 8PM at Ferrari World Abu Dhabi. UAE residents can also avail the Residents Offer throughout Chinese New Year.